An octopus, a shark, and a lobster walk onto the beach...stop me if you've heard this one. 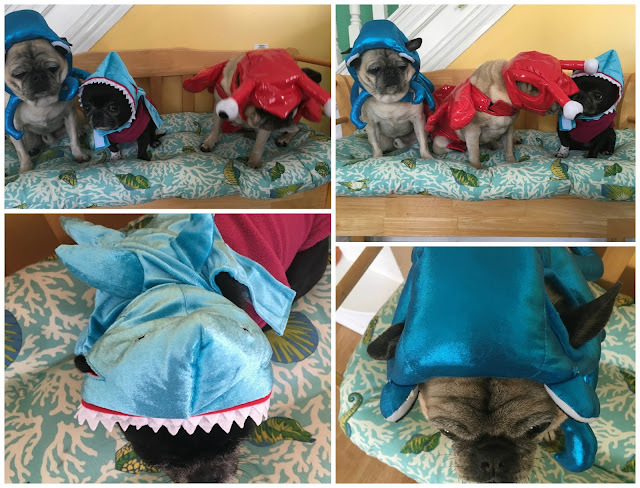 The lobster (Gus) hated it but the octopus (Geege) and the shark (Mae) are resigned to costumes on Halloween. I can't help it, I laugh myself silly when they're dressed up. But I know it's not their favorite. Their favorite is food, and lots of pets and rubs and running wild and free are a distant second and third. So putting up with my insanity is not without reward for these dogs. 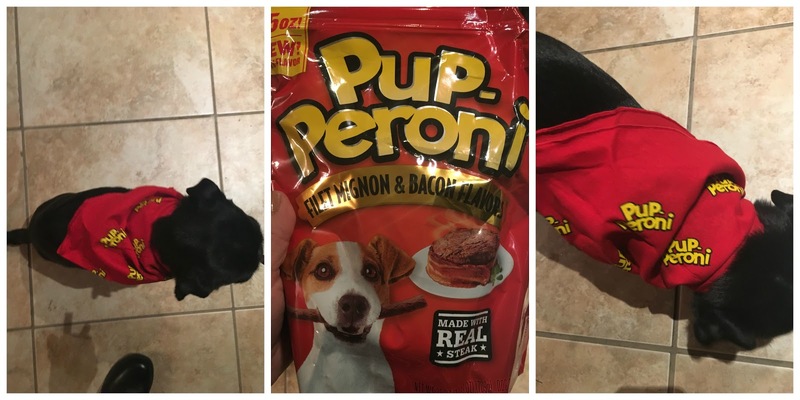 After dress up day, I bribed them to love me again with the new Filet Mignon & Bacon Flavored Pup-peroni treats the folks there were nice enough to send los perros for them to try, gratis, in exchange for me writing a post about it. Did they like them? Look at Mae's tail going a million miles an hour. 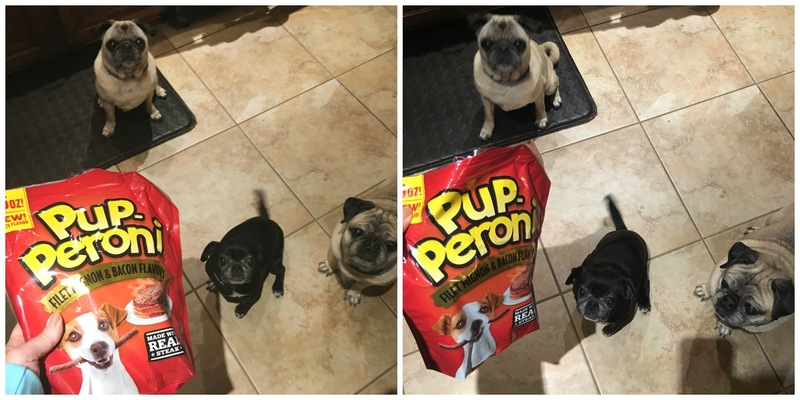 Look at Gus and Geege staring at the bag in the second photo like they've got the eye of the tiger. They're dogs, and the treats are filet and bacon flavored...of course they liked them.That's like asking if humans like chips or ice cream. Everyone likes a treat every once in a while. My dogs like what I like, and since choice steak and bacon are high on my list, these treats were high on theirs. These dogs have barely any teeth left so while I prefer the Isle of Dogs treats on a daily basis, these soft, chewy treats are great for treat days we all deserve. To learn more about these treats, click here. Speaking of treats, I hope you get a lot of them today for Halloween, even if you have to dress up like a fool to get them. 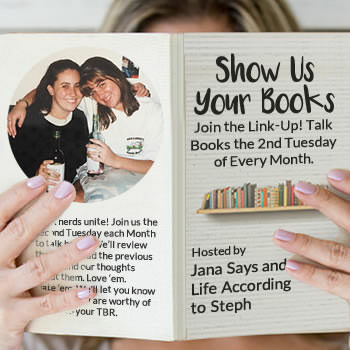 I am traveling and will reply to comments when I return. Thanks for stopping by! Adorable. I am with them. Dressing up- ew. I'd rather spend on real clothes! Happy and safe and sound Halloween 👻 to everyone! Perfect Halloween post. Love. Your. Momma. So adorable! I buy these treats fairly often and our dogs like them. Best. Costumes. Ever. Pugs AKA Sea Squad are my favs. This just made my whole entire day. They win halloween. The poor lobster looks so miserable! As always very very cut pups! Hehehehe, dogs in costumes are the best :) Ly was the little mermaid this year and Enzo was a turtle! Ha! They'd fit in pretty well with your sea creatures! I die!! I love the grumble on Halloween. Hawkeye isn't nearly as compliant. Definitely getting her shark fin on her tonight. She's also a fan of the Pup-peronis, so I'll have to pick some up. They look so adorable! I was hoping you would get a chance to post pics before your trip because I just adore pets in costumes. It makes me laugh, which is the best way to start Monday. Max was not fond of his costume but I gave him extra treats to accommodate him too. Your dog costume posts are something I look forward to every year!!! They are freaking adorable! I love that Mae was a shark, it seems to fit her personality. Mac will have no part in costume tomfoolery. He won't even humor me for treats. Cutest dog costumes ever! I'm pretty sure that Dart would be freaking out about having that costume on too, but you can't help doing it to them when they look that cute! oh my gosh, animals in costumes always makes me laugh, especially if they hate them. we found a hot dog costume and put it on the cats and they HATED us and it was hilarious. Ahh I love it! They are too cute! Hope you're having a wonderful Vaca! Oh gosh, I love it and I love that they have themed costumes. Happy Halloween! These are WAY too adorable! Happy Halloween! Oh my gosh, these costumes are hilarious. I am cracking up. They definitely earned their treats! I wanted so badly to dress are as I have but my husband was just not having it. However yours are adorable and I really love the lobster costume even if he didn't! So cute!